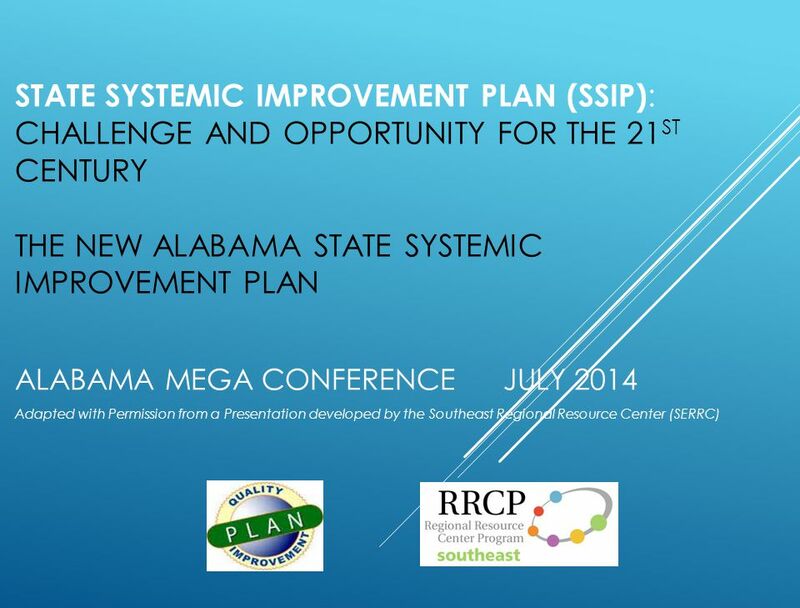 STATE SYSTEMIC IMPROVEMENT PLAN (SSIP) : CHALLENGE AND OPPORTUNITY FOR THE 21 ST CENTURY THE NEW ALABAMA STATE SYSTEMIC IMPROVEMENT PLAN ALABAMA MEGA CONFERENCE. 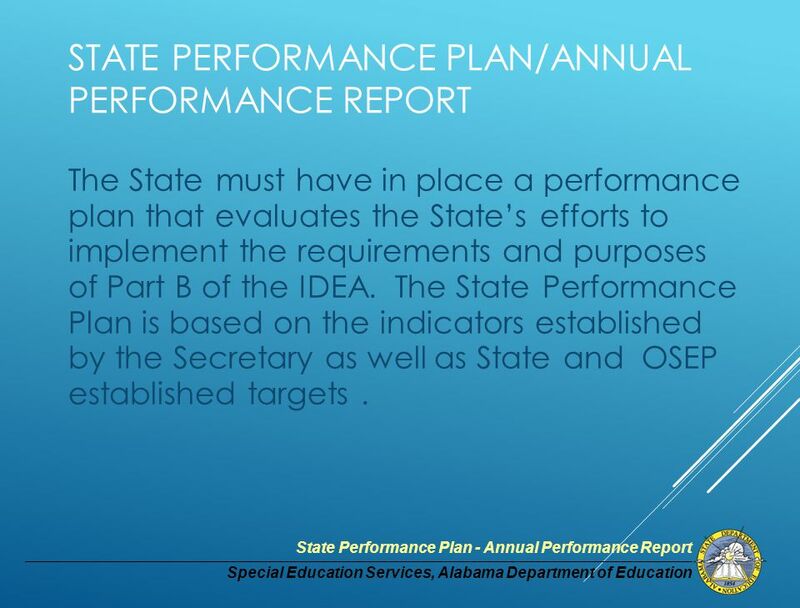 3 Special Education Services, Alabama Department of Education State Performance Plan - Annual Performance Report STATE PERFORMANCE PLAN/ANNUAL PERFORMANCE REPORT The State must have in place a performance plan that evaluates the State’s efforts to implement the requirements and purposes of Part B of the IDEA. 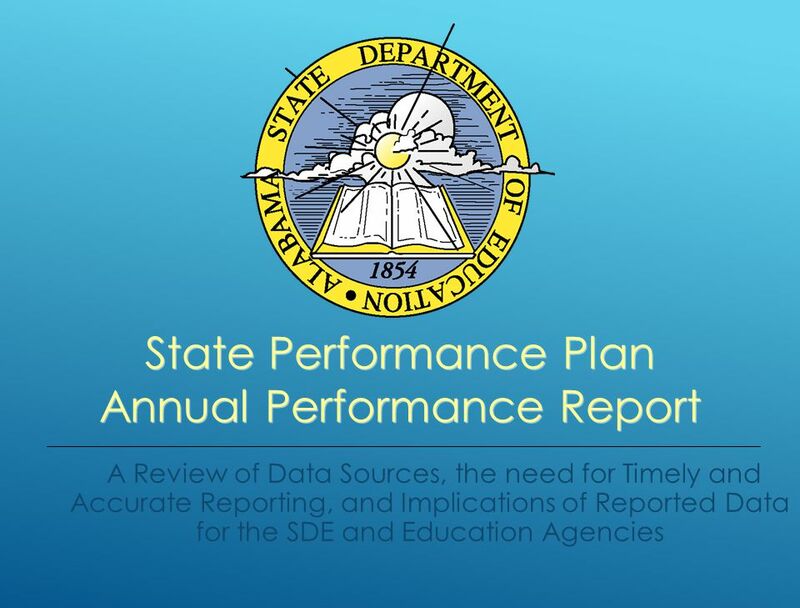 The State Performance Plan is based on the indicators established by the Secretary as well as State and OSEP established targets. 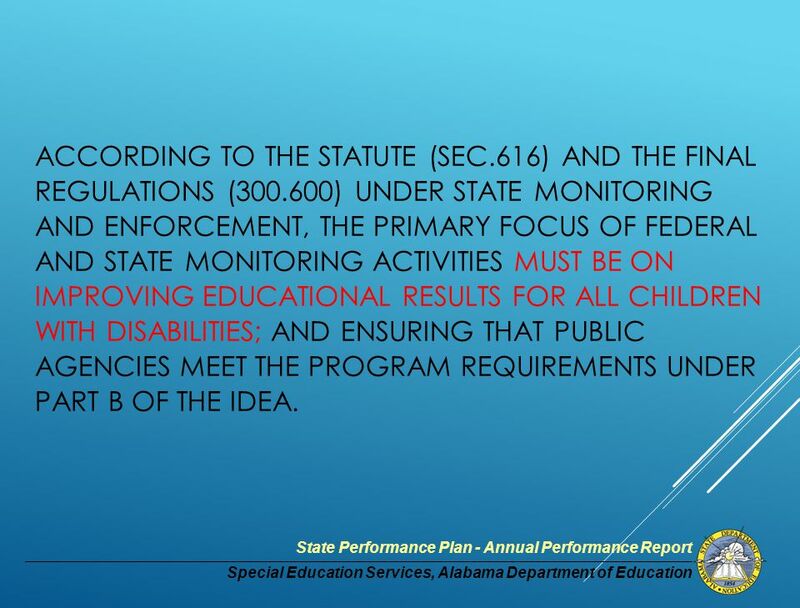 4 Special Education Services, Alabama Department of Education State Performance Plan - Annual Performance Report ACCORDING TO THE STATUTE (SEC.616) AND THE FINAL REGULATIONS (300.600) UNDER STATE MONITORING AND ENFORCEMENT, THE PRIMARY FOCUS OF FEDERAL AND STATE MONITORING ACTIVITIES MUST BE ON IMPROVING EDUCATIONAL RESULTS FOR ALL CHILDREN WITH DISABILITIES; AND ENSURING THAT PUBLIC AGENCIES MEET THE PROGRAM REQUIREMENTS UNDER PART B OF THE IDEA. 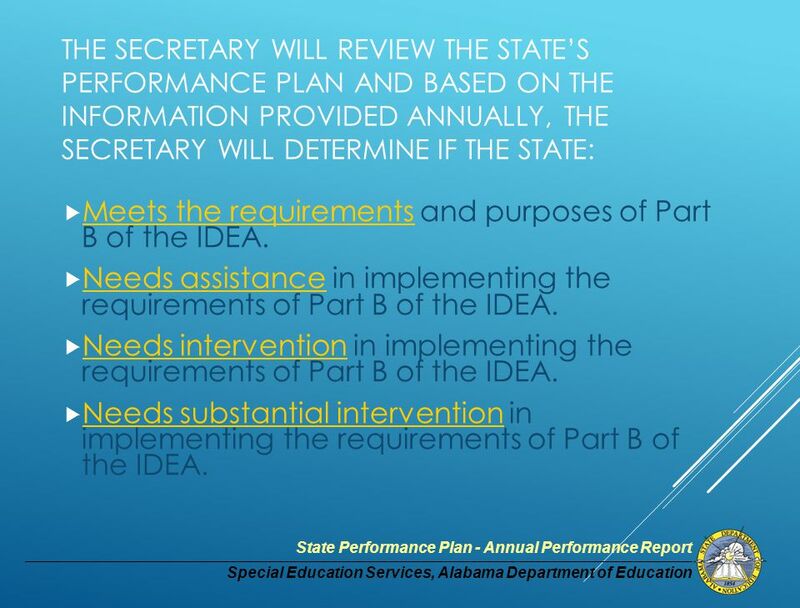 5 Special Education Services, Alabama Department of Education State Performance Plan - Annual Performance Report THE SECRETARY WILL REVIEW THE STATE’S PERFORMANCE PLAN AND BASED ON THE INFORMATION PROVIDED ANNUALLY, THE SECRETARY WILL DETERMINE IF THE STATE:  Meets the requirements and purposes of Part B of the IDEA. 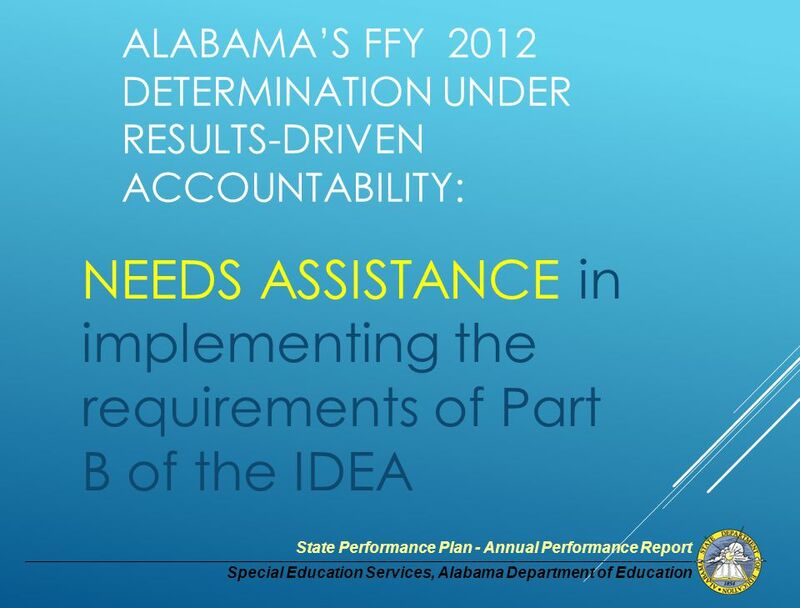  Needs assistance in implementing the requirements of Part B of the IDEA. 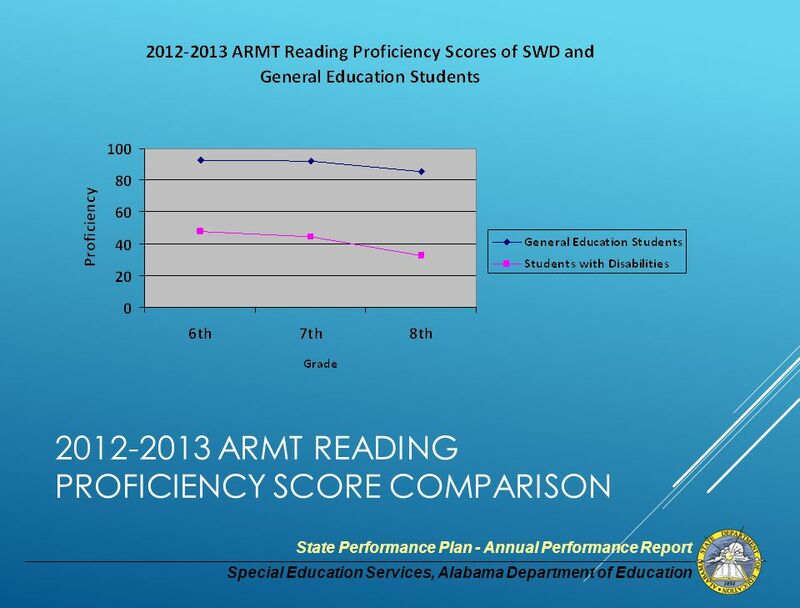  Needs intervention in implementing the requirements of Part B of the IDEA. 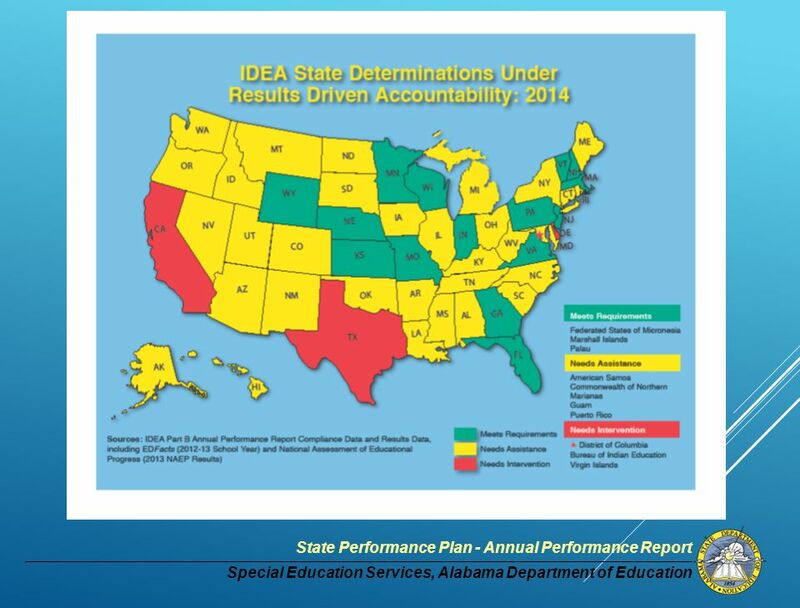  Needs substantial intervention in implementing the requirements of Part B of the IDEA. 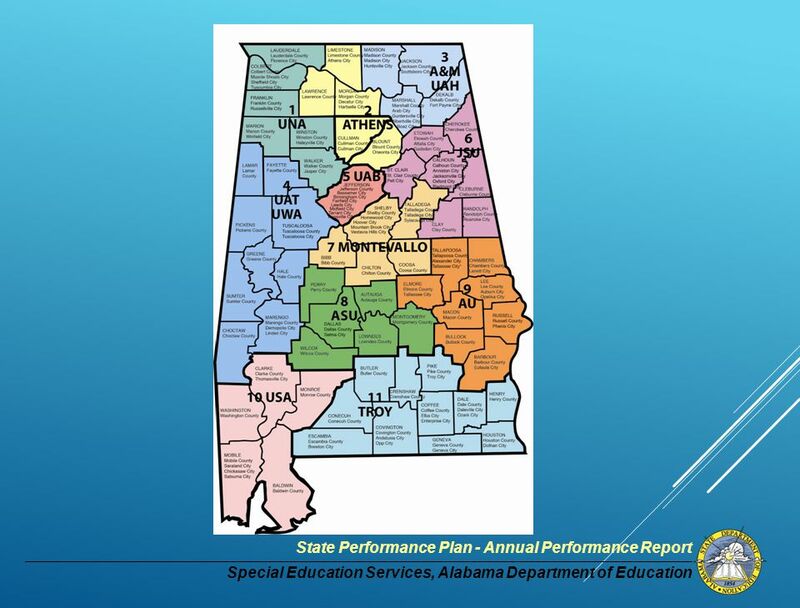 6 Special Education Services, Alabama Department of Education State Performance Plan - Annual Performance Report THE CURRENT SPP PERIOD SPANNED THE YEARS FROM 2005-2012. 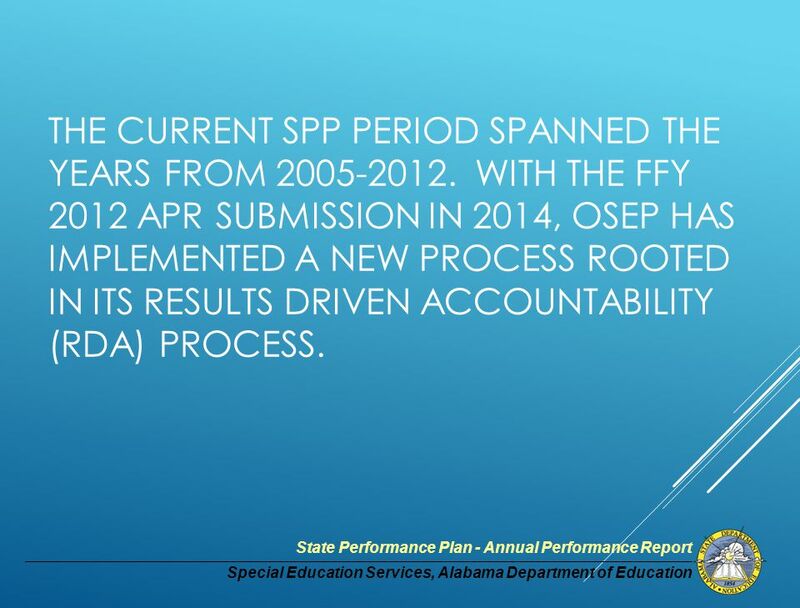 WITH THE FFY 2012 APR SUBMISSION IN 2014, OSEP HAS IMPLEMENTED A NEW PROCESS ROOTED IN ITS RESULTS DRIVEN ACCOUNTABILITY (RDA) PROCESS. 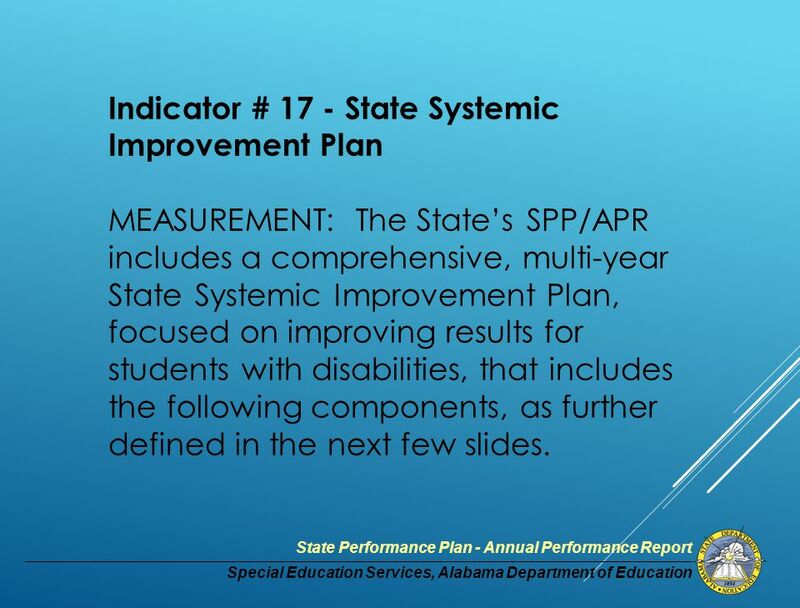 14 Special Education Services, Alabama Department of Education State Performance Plan - Annual Performance Report Indicator # 17 - State Systemic Improvement Plan MEASUREMENT: The State’s SPP/APR includes a comprehensive, multi-year State Systemic Improvement Plan, focused on improving results for students with disabilities, that includes the following components, as further defined in the next few slides. 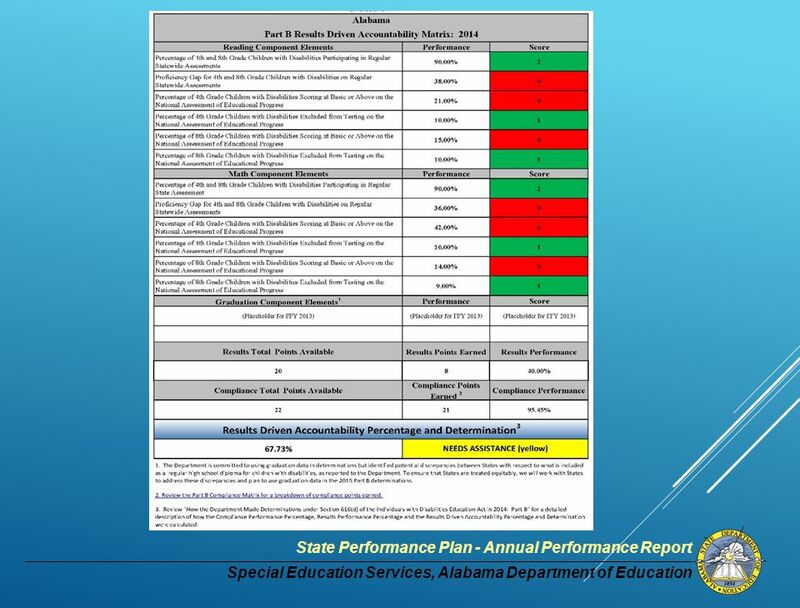 15 Special Education Services, Alabama Department of Education State Performance Plan - Annual Performance Report Indicator # 17 - State Systemic Improvement plan Phase I (which the State must include with its 2015 submission of its SPP/APR for FFY 2013): a.Data Analysis; b.Identification of the State-Identified Measurable Result c.Infrastructure to Support Improvement and Build Capacity; and d.Theory of Action or Hypothesis. 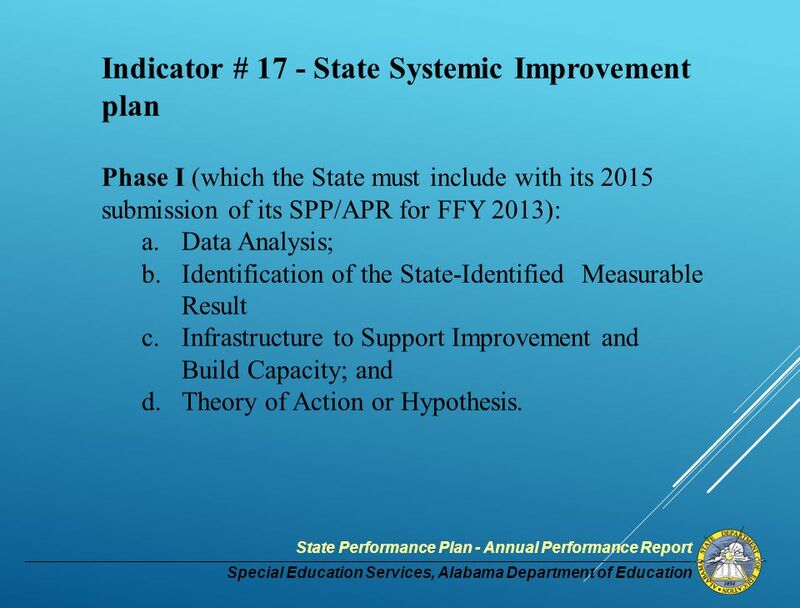 16 Special Education Services, Alabama Department of Education State Performance Plan - Annual Performance Report STATE SYSTEMIC IMPROVEMENT PLAN Indicator # 17 - State Systemic Improvement plan Phase II (which, in addition to the Phase 1 content outlined above, the State must include with its 2016 submission of its SPP/APR for FFY 2014): e.Infrastructure Development; f.Support for local educational agency Implementation of Evidence-Based Practices; and Evaluation Plan. 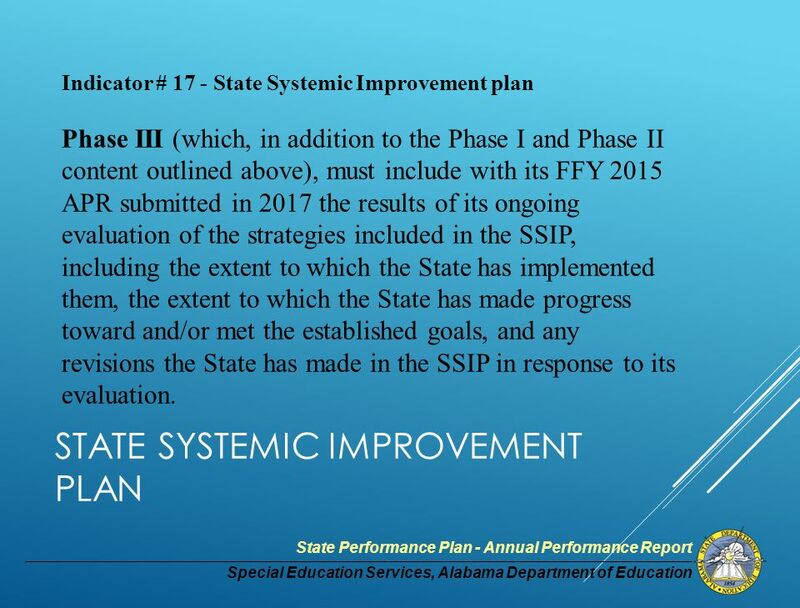 17 Special Education Services, Alabama Department of Education State Performance Plan - Annual Performance Report STATE SYSTEMIC IMPROVEMENT PLAN Indicator # 17 - State Systemic Improvement plan Phase III (which, in addition to the Phase I and Phase II content outlined above), must include with its FFY 2015 APR submitted in 2017 the results of its ongoing evaluation of the strategies included in the SSIP, including the extent to which the State has implemented them, the extent to which the State has made progress toward and/or met the established goals, and any revisions the State has made in the SSIP in response to its evaluation. 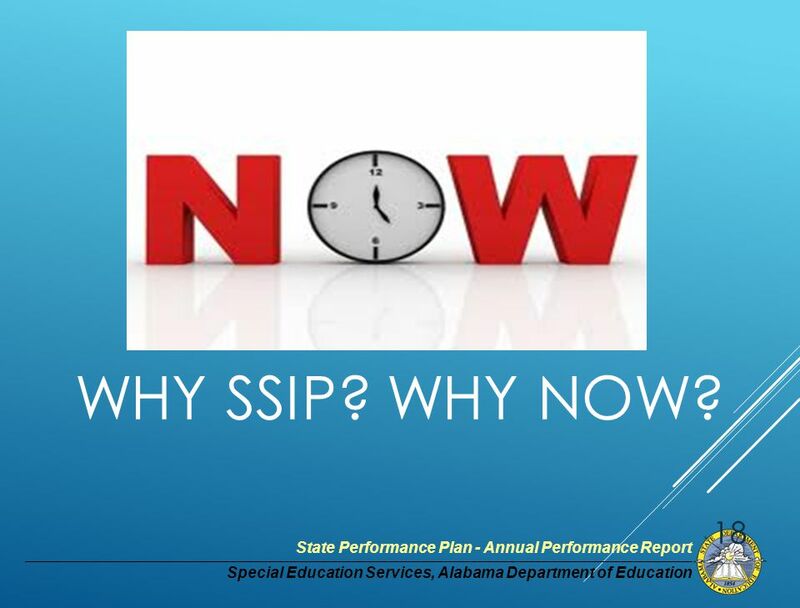 19 Special Education Services, Alabama Department of Education State Performance Plan - Annual Performance Report WHY SSIP? WHY NOW? 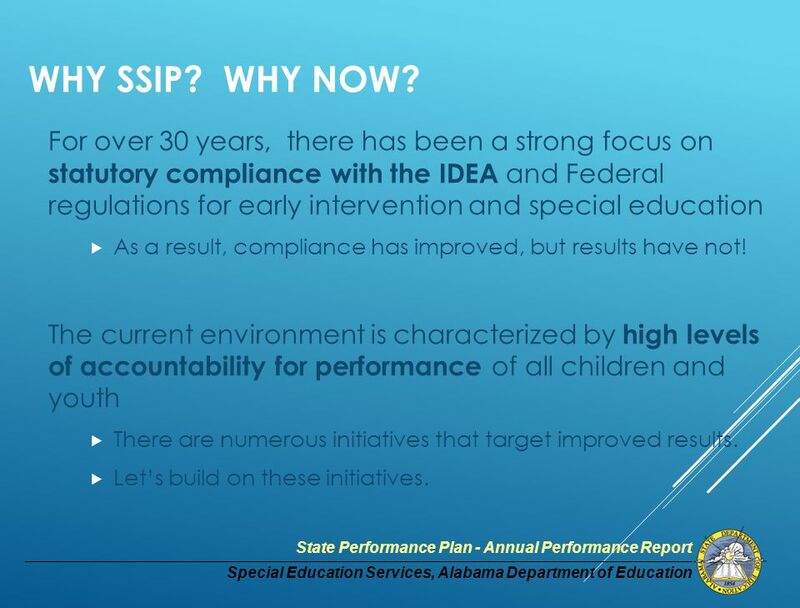 For over 30 years, there has been a strong focus on statutory compliance with the IDEA and Federal regulations for early intervention and special education  As a result, compliance has improved, but results have not! 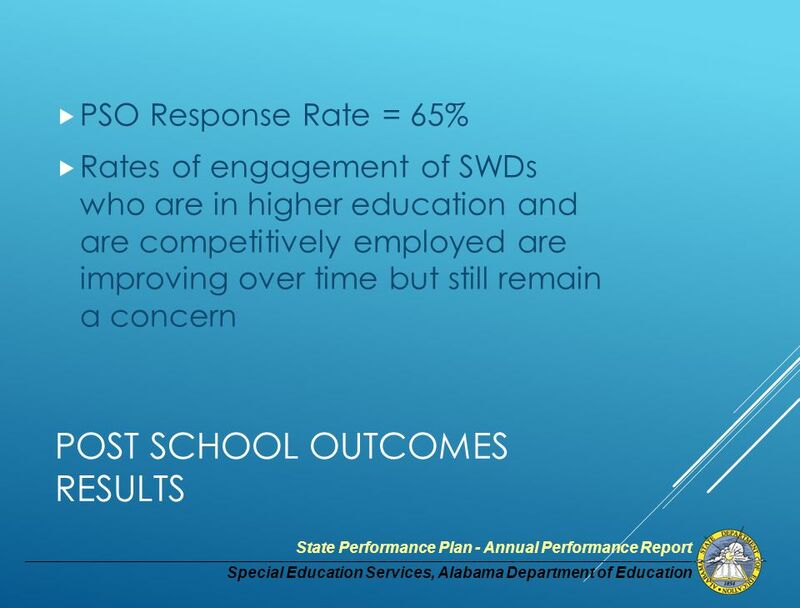 The current environment is characterized by high levels of accountability for performance of all children and youth  There are numerous initiatives that target improved results.  Let’s build on these initiatives. 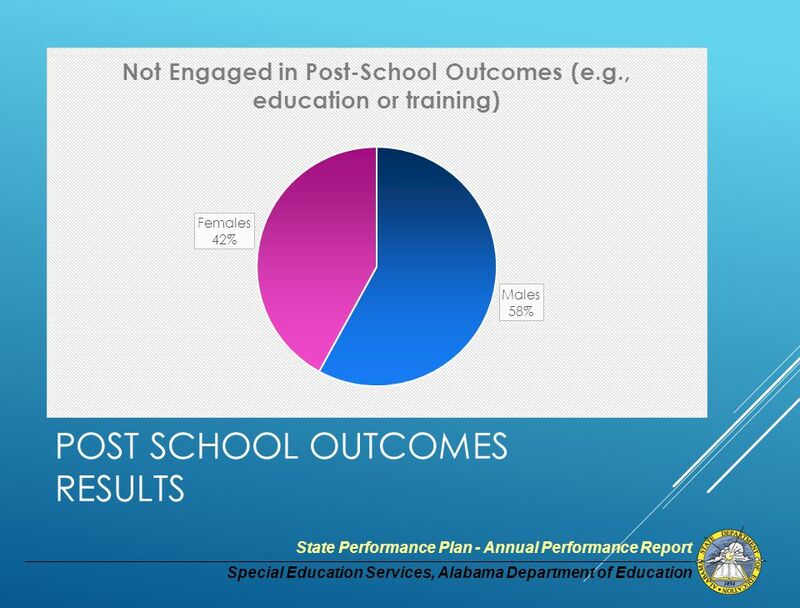 22 Special Education Services, Alabama Department of Education State Performance Plan - Annual Performance Report CURRENT DATA: 14A: 24.9% were enrolled in higher education within one year of leaving high school. 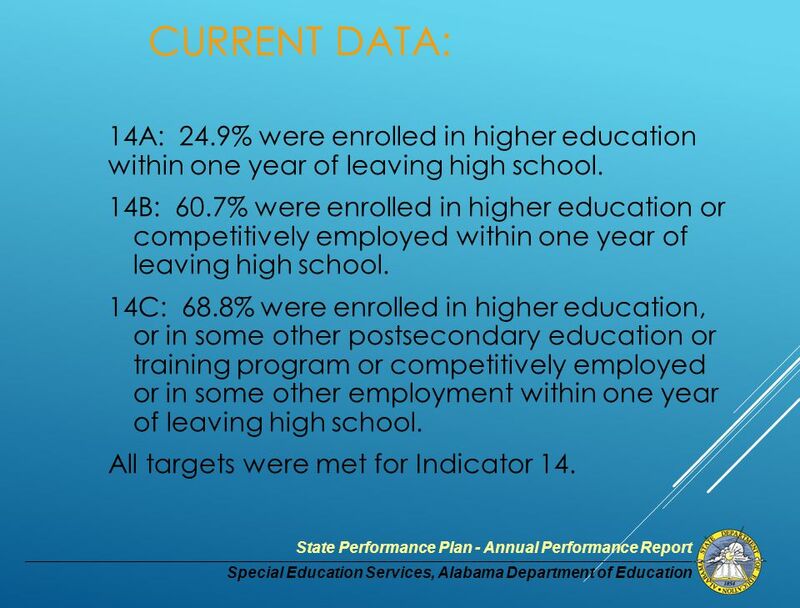 14B: 60.7% were enrolled in higher education or competitively employed within one year of leaving high school. 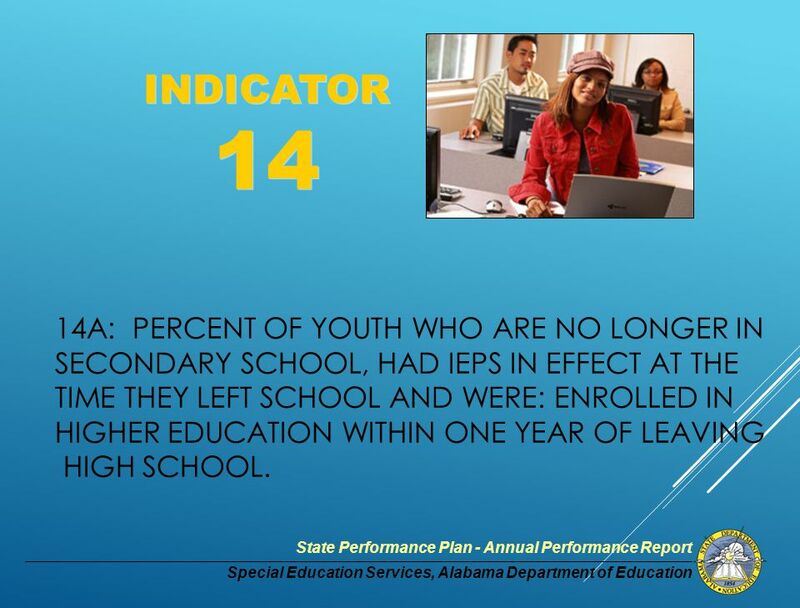 14C: 68.8% were enrolled in higher education, or in some other postsecondary education or training program or competitively employed or in some other employment within one year of leaving high school. All targets were met for Indicator 14. 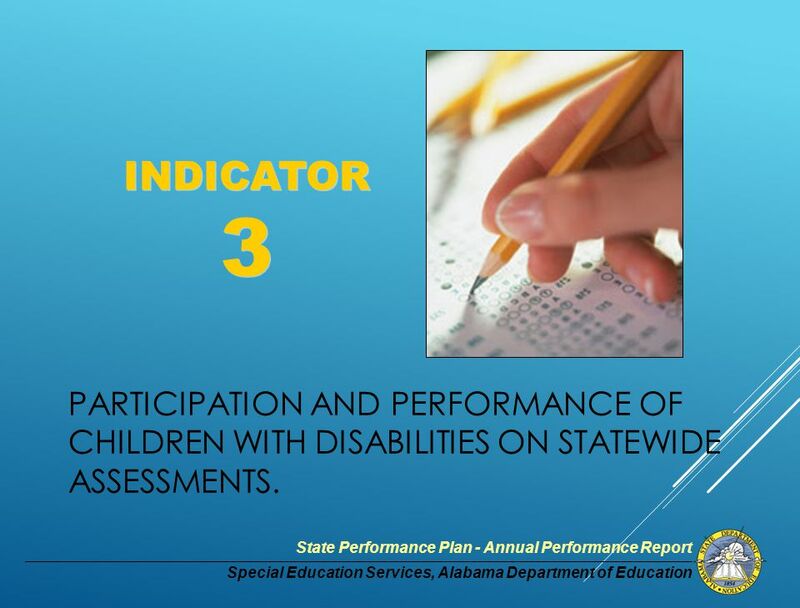 26 Special Education Services, Alabama Department of Education State Performance Plan - Annual Performance Report PERCENT OF CHILDREN WITH IEPS AGED 6 THROUGH 21: INDICATOR 5 A. Inside regular class 80% or more of the day; B. 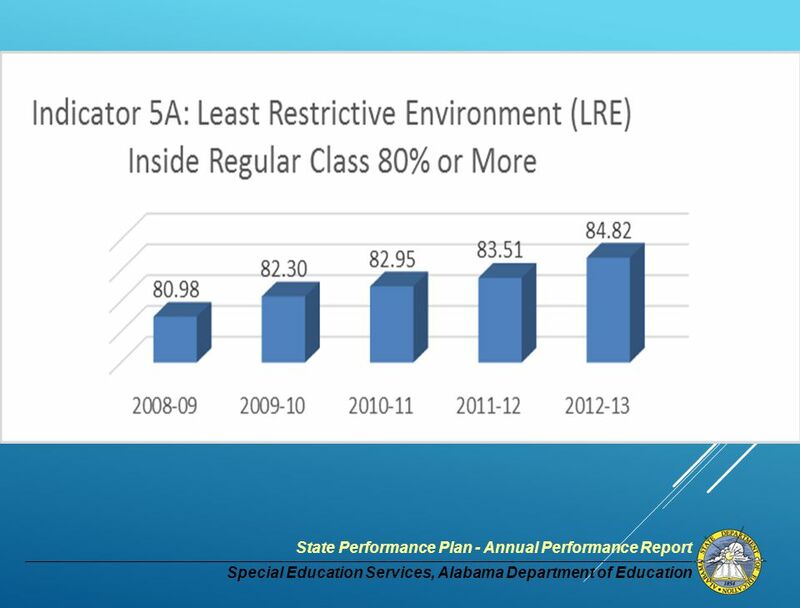 Inside regular class less than 40% of the day; or C. Served in public/private separate schools, residential/homebound/hospital placements. 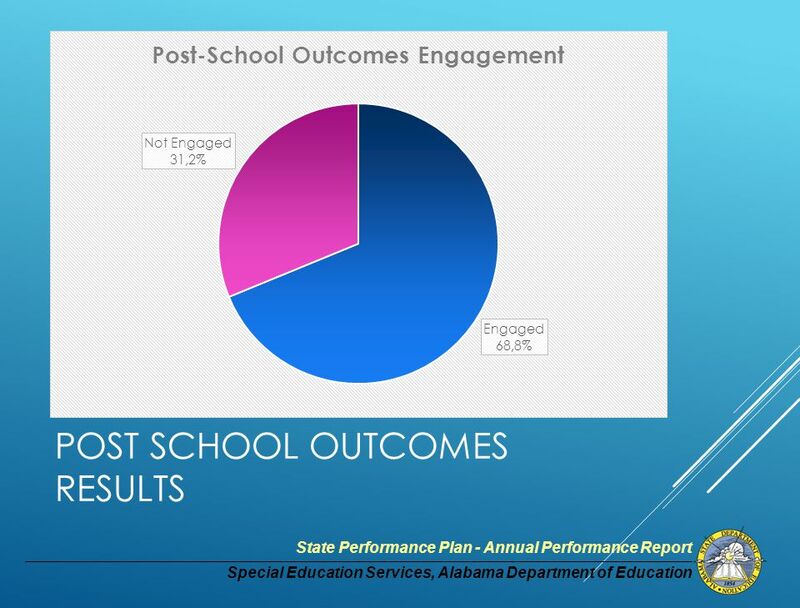 27 Special Education Services, Alabama Department of Education State Performance Plan - Annual Performance Report CURRENT DATA: 2012-2013 A. 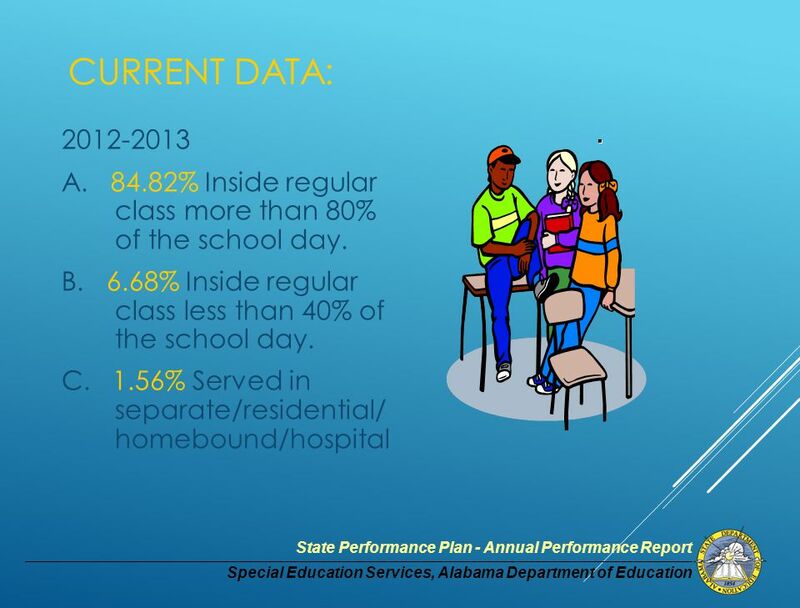 84.82% Inside regular class more than 80% of the school day. B. 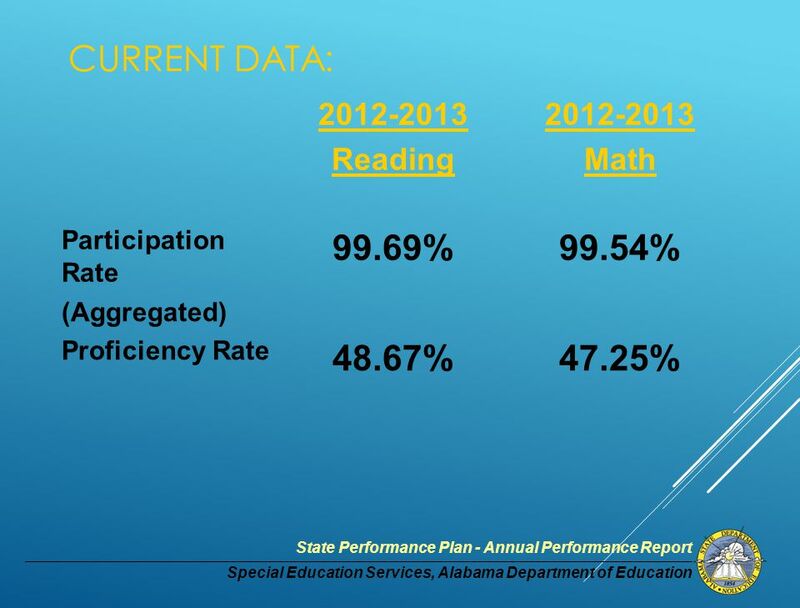 6.68% Inside regular class less than 40% of the school day. 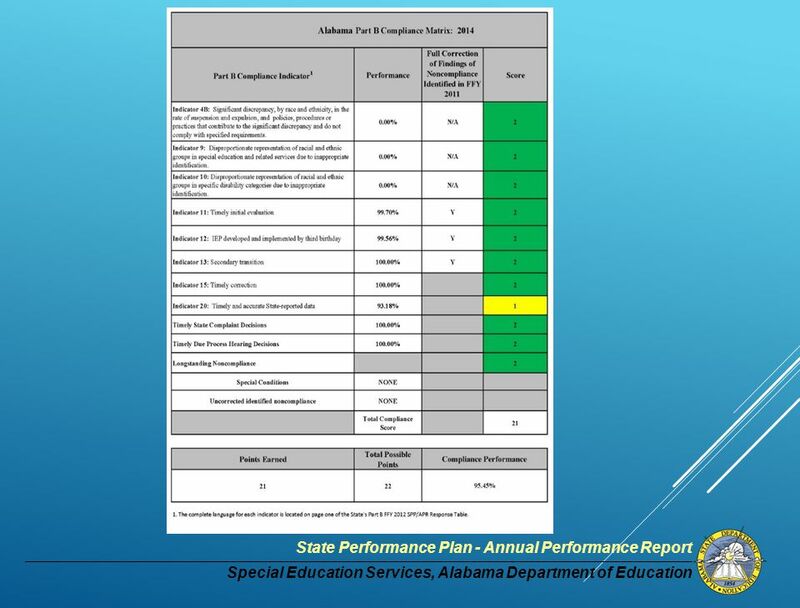 C. 1.56% Served in separate/residential/ homebound/hospital..
35 Special Education Services, Alabama Department of Education State Performance Plan - Annual Performance Report EMERGING DATA SOURCE: EVALUATION DATA ANALYZED BY EVERGREEN EVALUATION, INC. 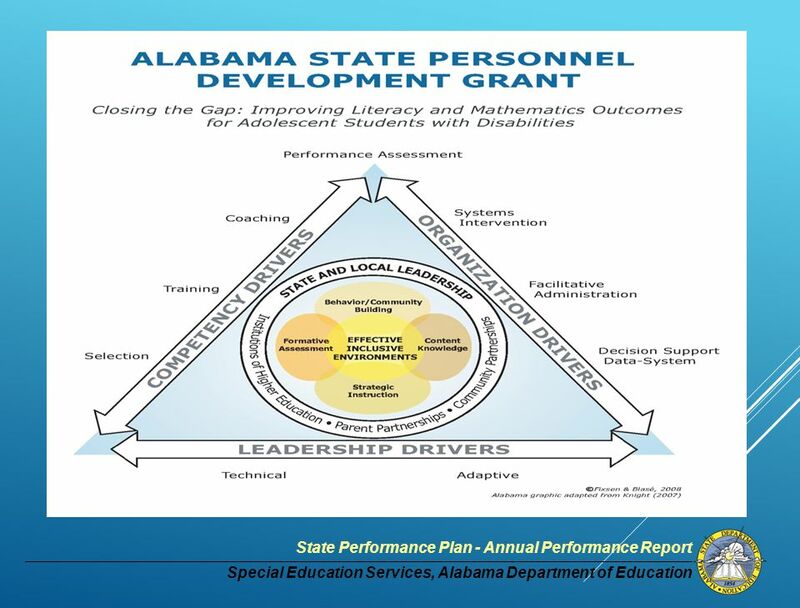 SUBMITTED THROUGH THE GRANT PERFORMANCE REPORT FOR THE ALABAMA STATE PERSONNEL DEVELOPMENT GRANT, MAY 2014. 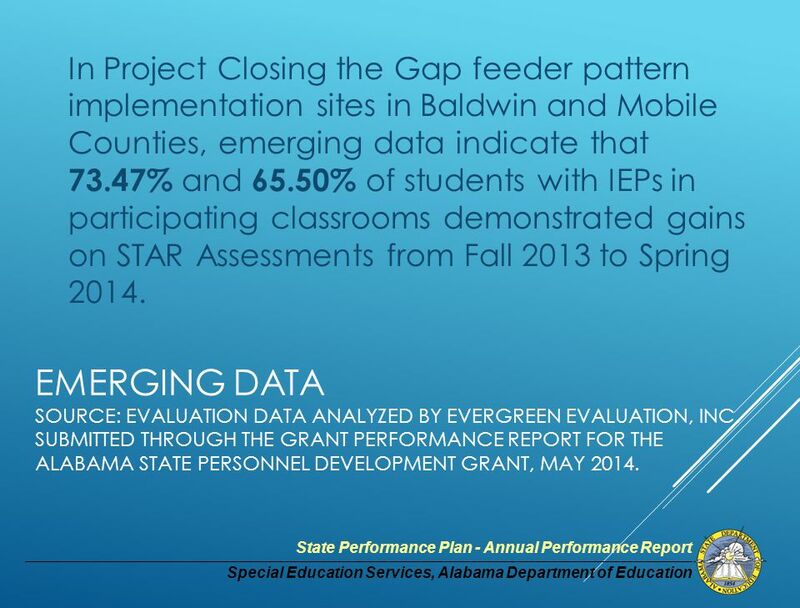 In Project Closing the Gap feeder pattern implementation sites in Baldwin and Mobile Counties, emerging data indicate that 73.47% and 65.50% of students with IEPs in participating classrooms demonstrated gains on STAR Assessments from Fall 2013 to Spring 2014. 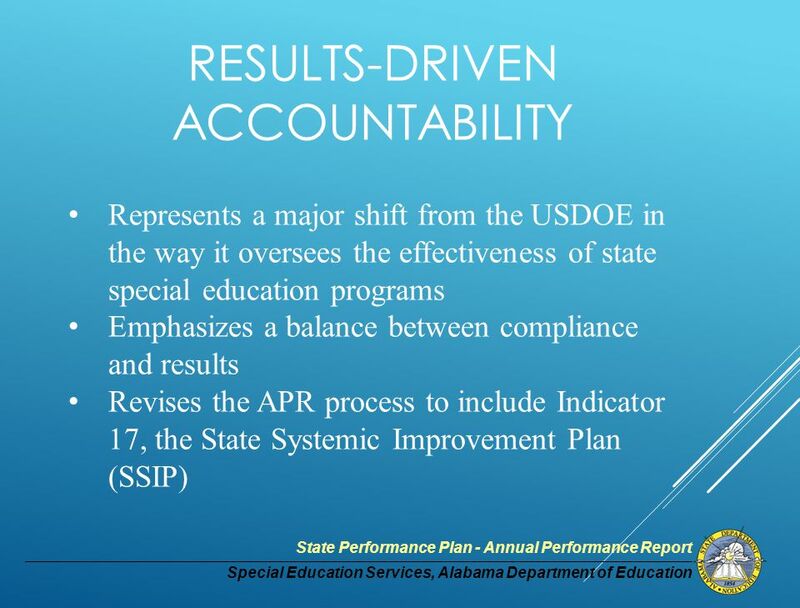 39 Special Education Services, Alabama Department of Education State Performance Plan - Annual Performance Report THEORY OF ACTION (HYPOTHESIS) If……then…. 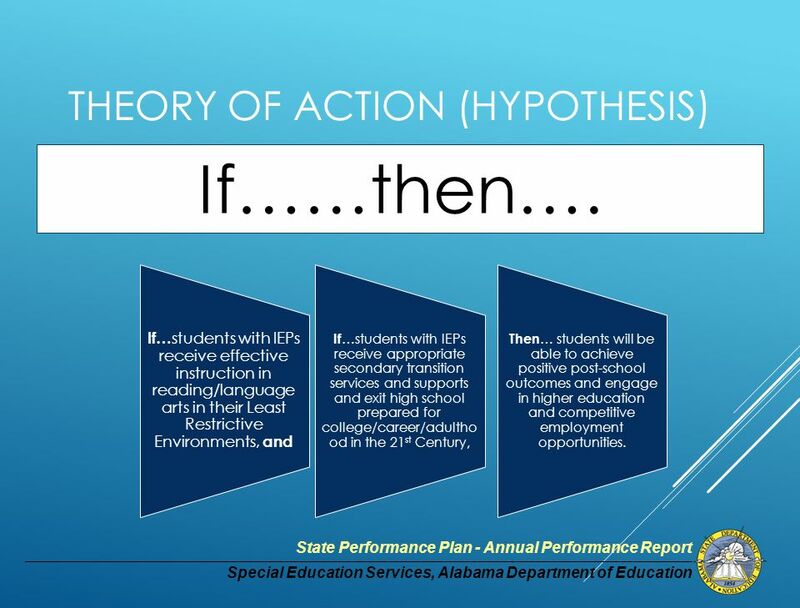 If… students with IEPs receive effective instruction in reading/language arts in their Least Restrictive Environments, and If …students with IEPs receive appropriate secondary transition services and supports and exit high school prepared for college/career/adultho od in the 21 st Century, Then … students will be able to achieve positive post-school outcomes and engage in higher education and competitive employment opportunities. 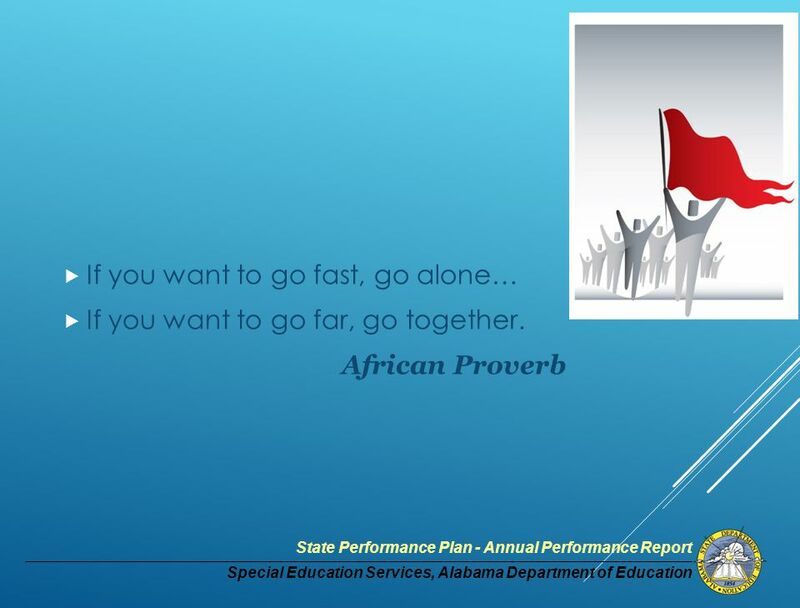 40 Special Education Services, Alabama Department of Education State Performance Plan - Annual Performance Report REMEMBER: WE ARE BUILDING A NEW SYSTEM. We’re building a dream also. 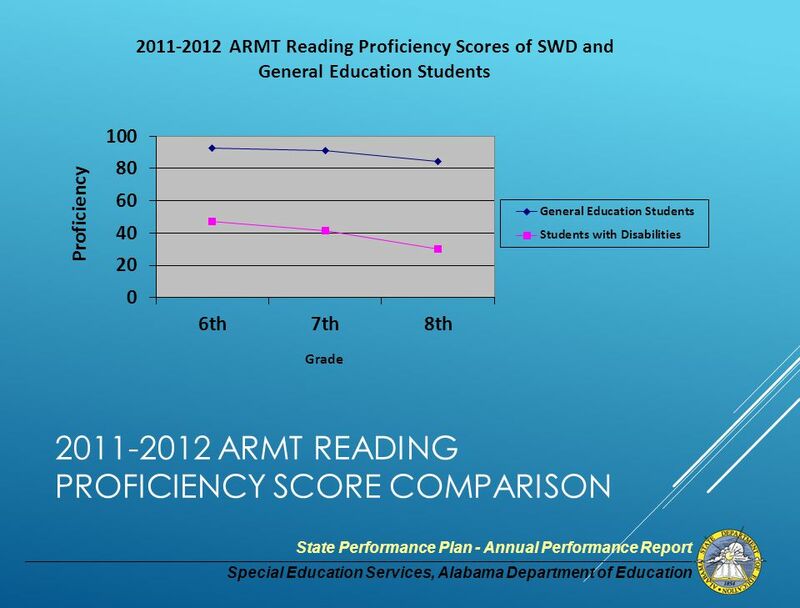 Our dream is improved results for children and youth with disabilities. 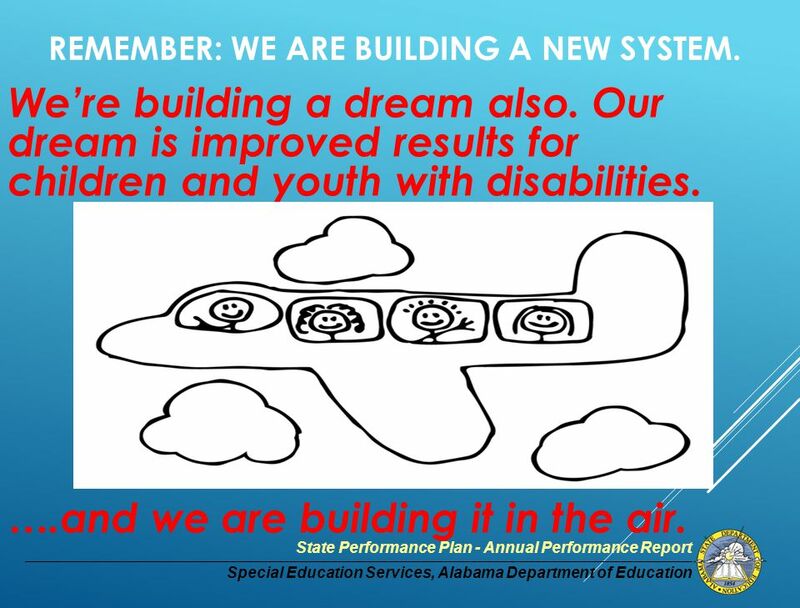 ….and we are building it in the air. 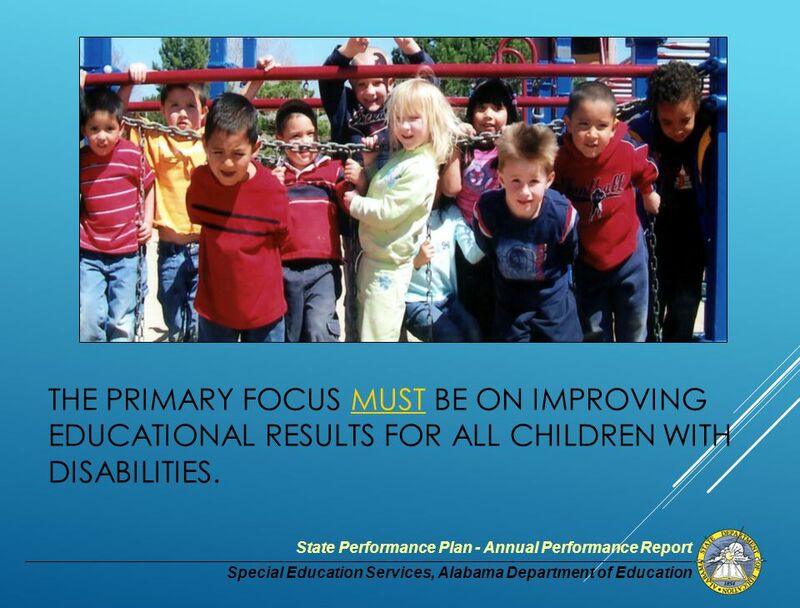 42 Special Education Services, Alabama Department of Education State Performance Plan - Annual Performance Report THE PRIMARY FOCUS MUST BE ON IMPROVING EDUCATIONAL RESULTS FOR ALL CHILDREN WITH DISABILITIES. 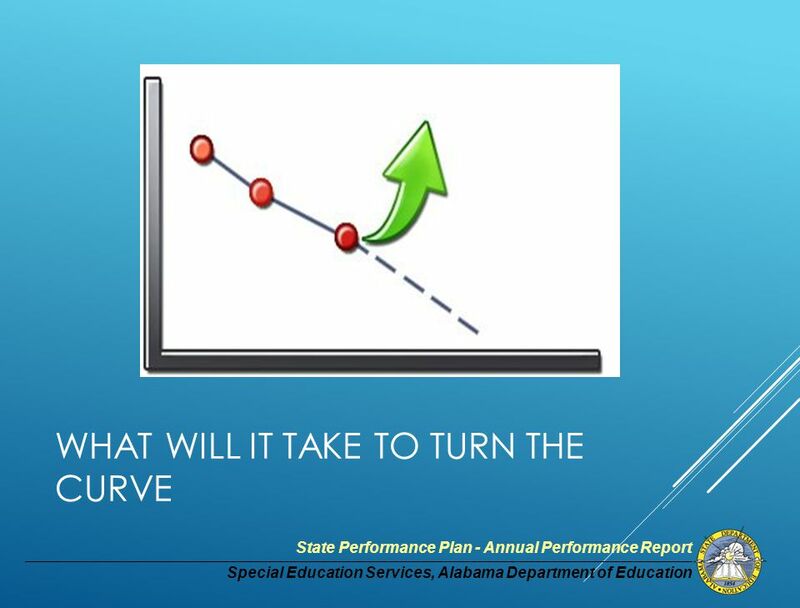 Download ppt "STATE SYSTEMIC IMPROVEMENT PLAN (SSIP) : CHALLENGE AND OPPORTUNITY FOR THE 21 ST CENTURY THE NEW ALABAMA STATE SYSTEMIC IMPROVEMENT PLAN ALABAMA MEGA CONFERENCE." 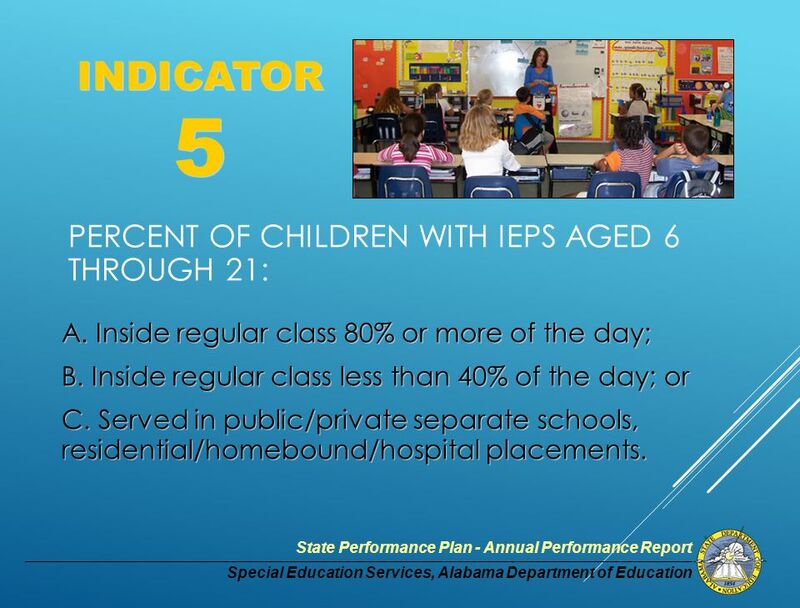 1 IDEA 2004 SPP Indicators Related to Transition: How We Collect the Data & What We Have Learned Ginger Blalock Summer Transition Meeting June 11, 2007. Construction Careers Center Charter High School CCC Career Coaching Participants. 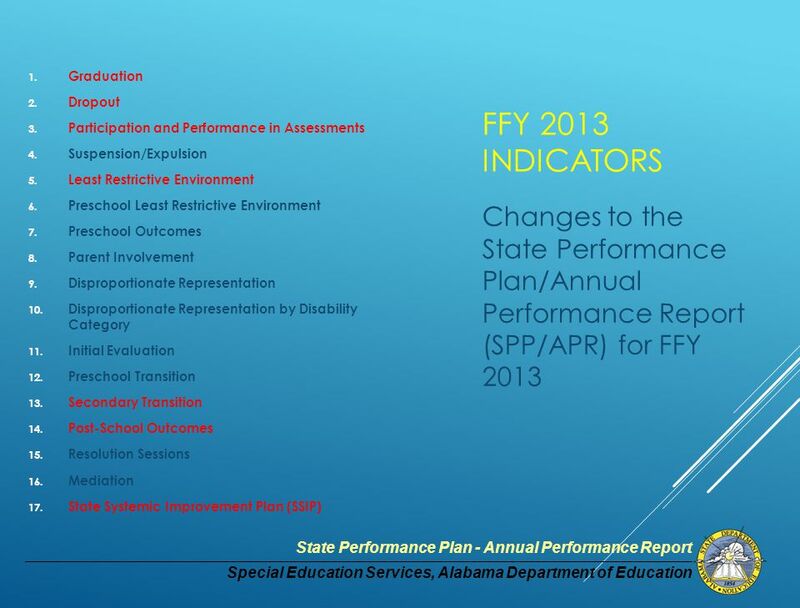 Secondary Transition Overview of State Performance Plan Indicators 1 – Graduation Rates, 2 – Dropout Rates, 13 – Transitional IEPs, and 14 – Post-school. 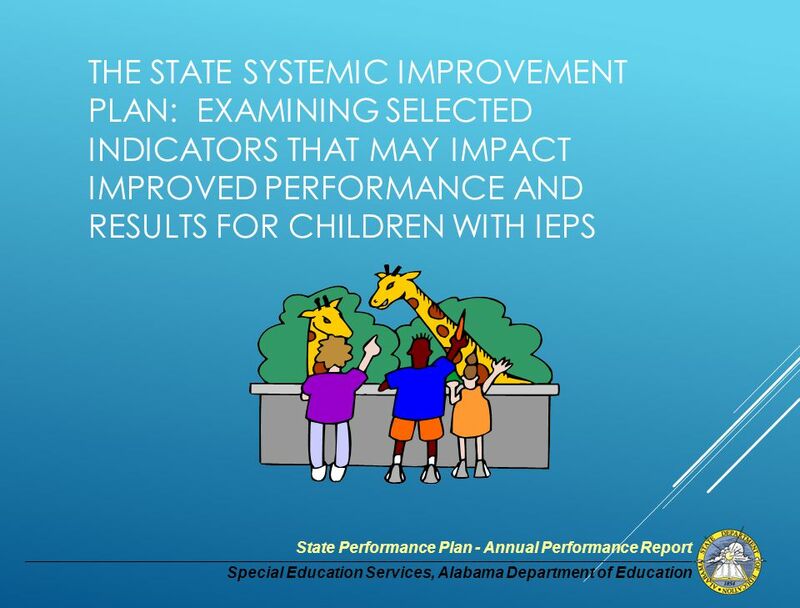 Student Performance Overview of State Performance Plan Indicators 3 – State Assessment Performance, 7 – Early Childhood Outcomes. 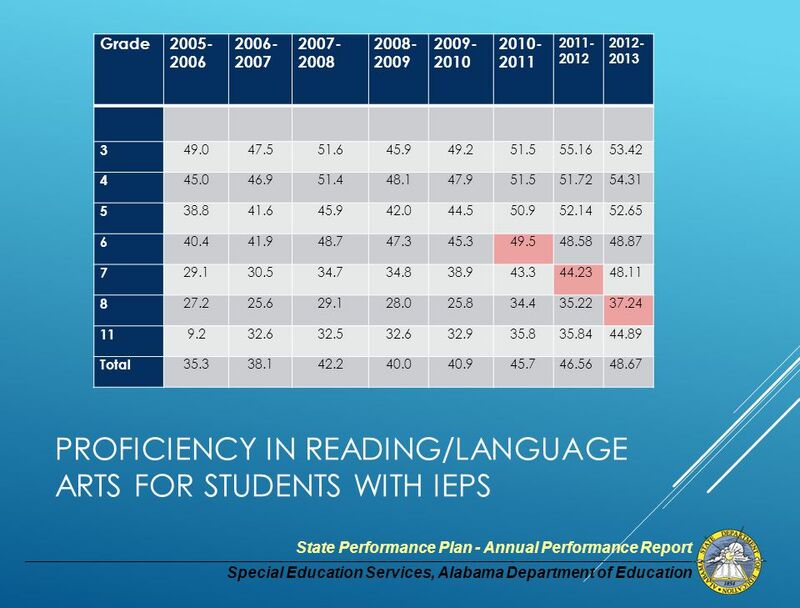 Erik McCormick Former OSEP Part B Data Manager September 29, 2006 Special Education Data – The Old, the New and the Huh? 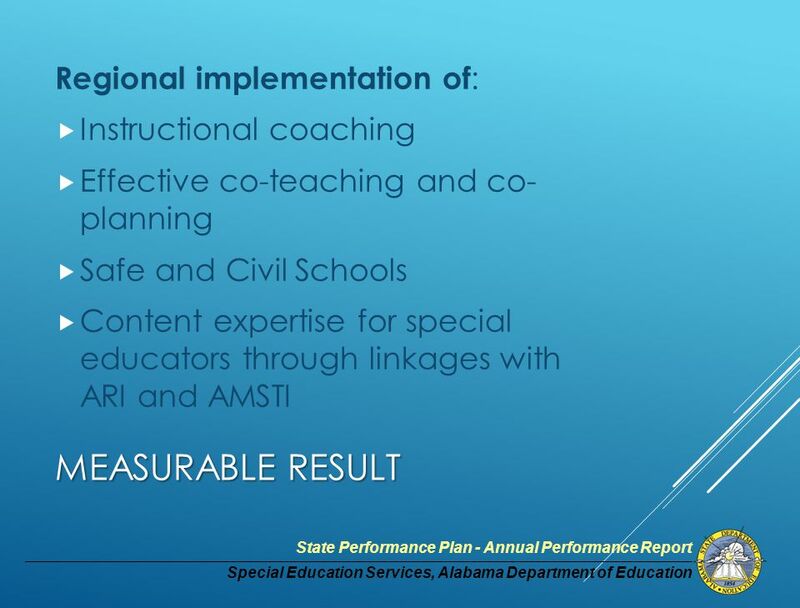 Six Year Plan Meeting the state targets Region Meeting August 16, 2007. 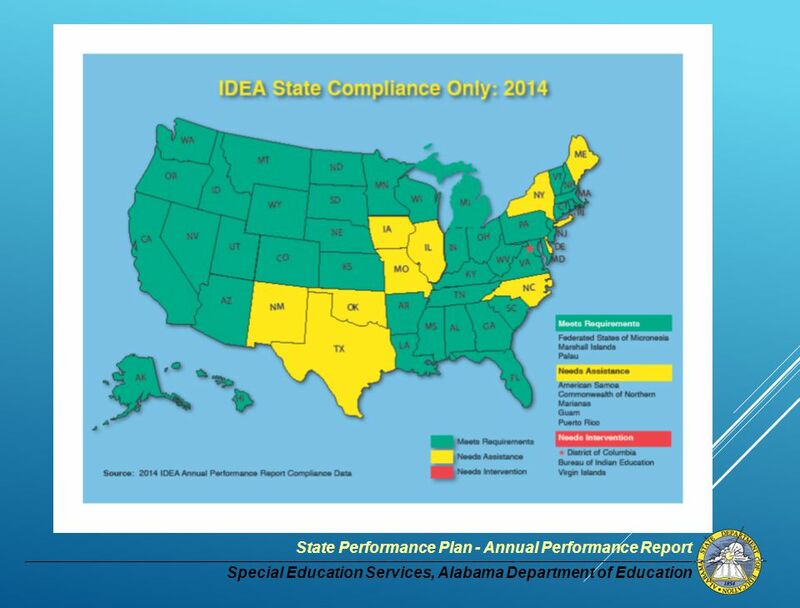 Updates in IDEA NCLB is the symbol of the paradigm shift to a new mission of universal high achievement From: All children will have universal access. 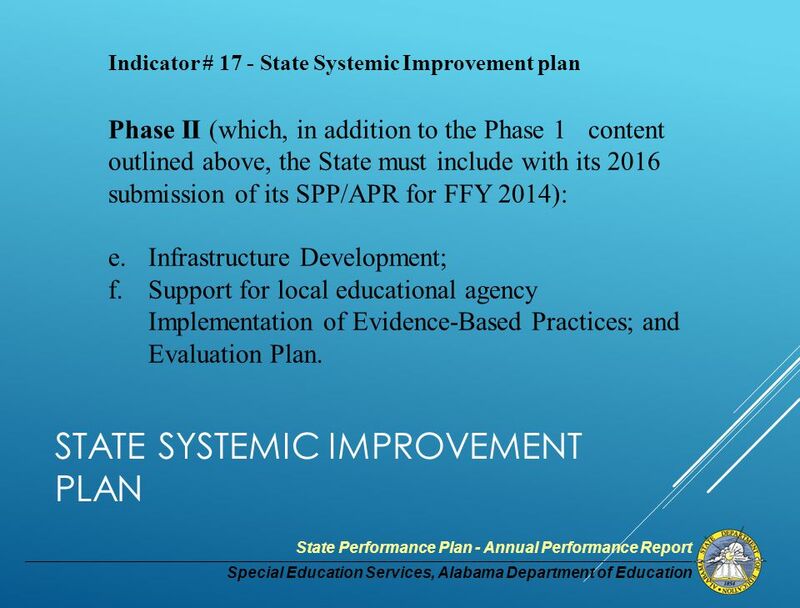 Virginia - March 2014 (Content adapted from 2014 MSRRC Forum) Preparing for the State Systemic Improvement Plan. 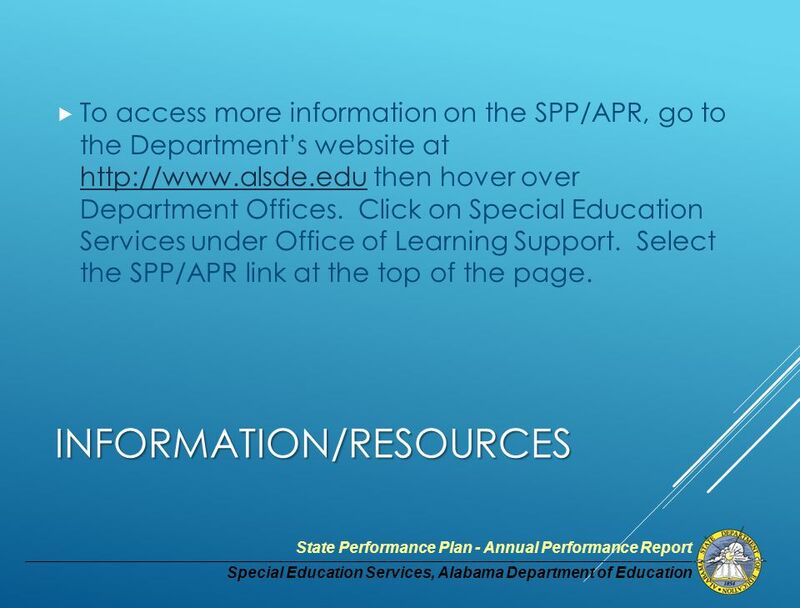 Richard Henderson Evelyn S. Johnson A NNUAL P ERFORMANCE R EPORT U PDATE Richard O’Dell Division of Special Education Idaho State Department of Education.